Like many websites, our own site is built on the WordPress platform. WordPress is a CMS (Content Management System) released in 2003. Within 5 years it had changed the landscape of the web forever, and fast forward to 2017, it’s now one of the most common CMS’ used by Webmasters and Business owners in the world. In fact it’s such a commonly used CMS that for the last several years, hosts that include cPanel or a similar software for managing your server, include a one click install solution for adding WordPress to your primary, sub or add-on domain/s. That’s all well and good, but MySQL and PHP aren’t exactly the darlings of the development world anymore for many reasons beyond the scope of this article, but what you need to know is that these two langs are no longer the most efficient option out there, and have never been the most secure. This means that WordPress suffers from some security issues, as well as speed issues. Most of this comes down to themes and plugins, so if you’re planning on using a theme that’s got a lot of features or plan on using a lot of plugins, your WordPress site is going to be slow and face vulnerabilities that you just wouldn’t get with a static site. Since static sites are no longer popular, since this involves more investment for a business owner or webmaster, and that many people simply don’t know how to build them, it’s imperative that you plan ahead for the inherent issues that WordPress users face and get yourself the right host. Our advice for you goes against the ‘conventional grain’, but with good reason. Please, PLEASE stay away from cheap shared hosting packages if you’re using WordPress. Load time, security and downtime all suffer badly on cheap shared hosting packages. So if you’re a WordPress users that are looking to get the best performance out of your site then read on. That being said, here’s what you do need to look out for as positives. Make no mistake, the hosts on our list are the absolute best we’ve come across, but that’s our personal experience and there may be other hosts you’ve come across during your own research. So here’s a basic guideline of what you need to be looking out for to make sure you’re not simply wasting your time and money. While things like themes, plugins and media on your site can seriously effect your site’s speed. You can generally tell how fast your host is by looking at averages on reviews like this (based on our own testing). This isn’t simply affected by how many sites they have on a server, although that is part of the problem, it’s also to do with hardware, data-centers and a few lesser factors. Finding out the average is important so you can get the best possible speed performance right from the get go. Is your website’s host’s uptime reliable? It’s a big question​ to be answered. If your website goes down once a week that’s not good. If your website goes down once a month, that’s still not good. Having already mentioned hardware, why does this matter? Well, better hardware means better performance. Is your server an HDD or SSD? SSD is better so that’s just one example of a better server. Then there are the fairly obvious ones such as does it have more RAM than the average host at the price point you’re looking at. Keep this in mind when looking for a new host! 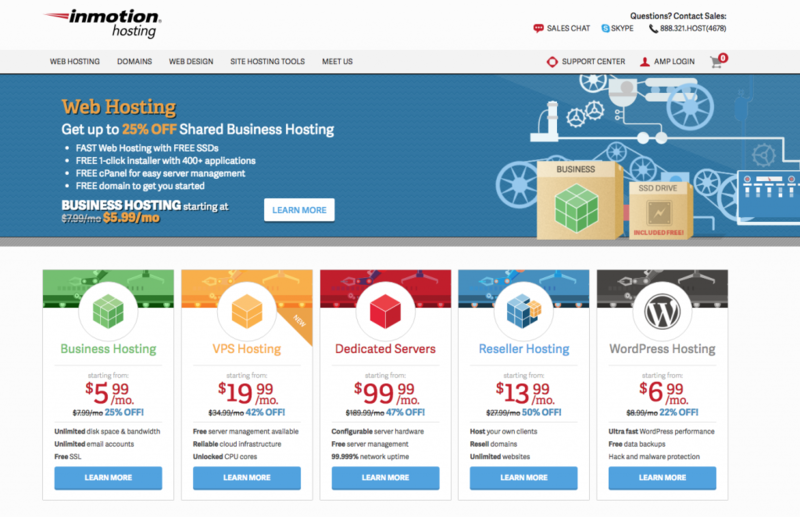 Does the host offer cPanel and is the server LAMP/WAMP? These are the two big questions for any potential WordPress user. cPanel offers easy installation, and most shared servers come with cPanel by default. The reason we mention it is the better performing servers are often not managed, this means you need to install all the software on the server yourself. This is a bit too technical for most people, so make a conscious effort to make sure that it’s on there and if not get in touch with the hosts support to ask if they can install it for you. Many hosts will now offer to install cPanel for a small one-time fee which is worth the money, believe me. As for LAMP/WAMP you need this as these server setups offer the core technology that WordPress uses… PHP & MySQL. A lot of hosts offer backups now, but some still don’t. I had this problem a few years ago and when my site broke (as has been known to happen on WordPress) I lost everything. There was no way to recover the site. If your host offers automated backups that’s a huge plus and if not you may need to get a third party option such as Backup Buddy (paid). As I said, things can go wrong on WordPress sites so you need good support from your host. If they don’t offer good support then at some point you’re going to get burned. Generally a lot of the biggest companies don’t have the greatest support. More modern and on the ball companies offer differing levels of support depending on the plan you’re on. So if you take our advice and select a better plan, you should have no problem with any of the hosts on our list. Regardless, all the hosts on this list offer better support to any user than a host like GoDaddy. 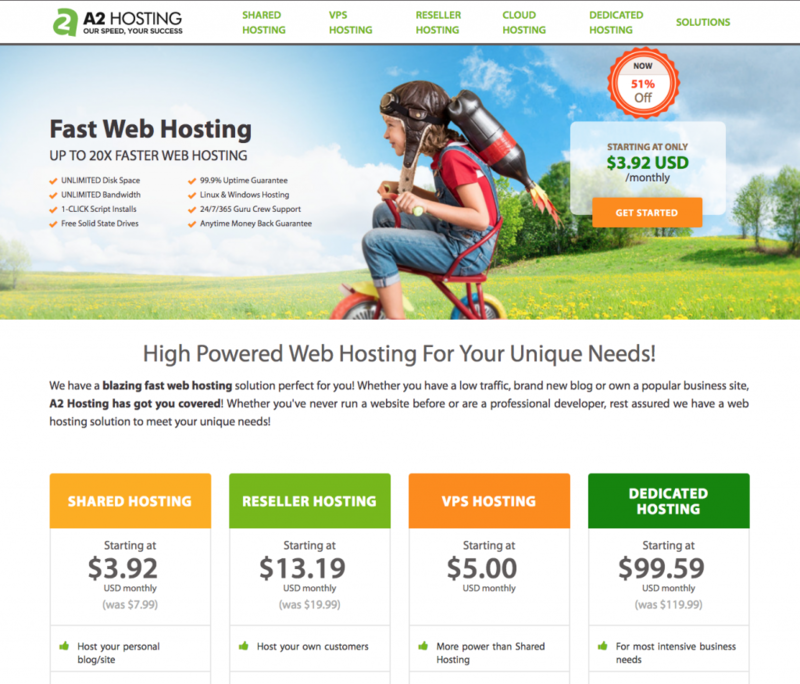 There are several different types of hosting you’ll find available, all with differing pros and cons as well as costs. As a side note, you may also come across people offering free wordpress hosting… These ‘deals’ should be avoided at all costs. Not only is there always a catch, there is also the serious issue that the hosting provider may simply remove your site without any notice. This has happened to a lot of people, so never use free hosting. It’s not worth the risk. Shared hosting is the most common and popular type of hosting for WordPress users, this is because shared hosting is extremely cheap compared to the other types of hosting. However, shared hosting is not optimal for WordPress sites for the reasons already explained in this article. Sharing a server with dozens if not more sites is not a great start for performance, and while hosts will tell you that your resources are unlimited, this is not exactly true. If your website starts to receive a lot of traffic, or use a lot of resources generally then you’ll be made to upgrade your plan. This isn’t ideal for any business owner, and you’ll inevitable wish you’d just picked the better plan from the beginning. The one exception for WordPress and Shared Hosting in our opinion, is small local businesses. Local businesses don’t generally receive huge amounts of traffic on a regular basis, nor update their site that often. However you will still want to make sure your data-center is in the same country as your business if this applies to you. VPS (Virtual Private Server) Hosting is our preferred hosting package for WordPress sites. While you’re still sharing the machine with a handful of others, the virtual machine (computer) is partitioned for each user meaning you get total control over the server. This is great if you’ve got technical knowledge, and if not you can opt for most good hosts to manage your VPS for you. * Managed VPS hosting essentially means they take care of the technical needs of the machine, updates of software and so on. The main benefit of VPS Hosting is the added performance, less users means more uptime and better response times. The hardware of these servers tends to be a little better than Shared as well, which means out of the gate you’re getting better performance regardless of the amount of users with a partition on the machine. Since VPS Hosting isn’t truly dedicated it means you’re not getting hit by the much pricier costs of a dedicated host! VPS Hosting is ideal for sites getting decent amounts of traffic per day; so bloggers, medium sized businesses and affiliate marketers take note. Dedicated servers tend to have the best hardware of all the servers, and since it’s dedicated, this means you’re leasing the entire machine. So you’ll be getting 100% of the power of that machine. This is hugely important for WordPress users that are receiving huge amounts of traffic per month. Since WordPress uses a lot of resources, if you’re doing substantial visitors per day, you’re going to need a dedicated server sooner rather than later. However, dedicated servers are not required for people starting out by any means. We’d always recommend a new WordPress site go on VPS or Shared packages (depending on the type of site). Since you have the entire machine, if you don’t know what you’re doing from a technical perspective you’re going to need to have a Managed Dedicated Hosting package. This is important when you think about the fact that WordPress runs on LAMP or WAMP servers. If you have no idea how to set all that up, you need a managed service. Managed dedicated hosting packages have by far the best customer support out of any hosting type we’ve encountered, so if you’re a larger business using WordPress this could be a huge positive for you. Managed WP Hosting is relatively new, but has come about due to the overwhelming popularity of WordPress as a CMS. Essentially managed WordPress hosting allows you to host WordPress sites and nothing else. The technical team behind the managed hosting setup everything for you, and decide what kind of machine your site needs to be on based on traffic figures, size and so on. While this sounds great, the truth is this kind of hosting is fairly expensive. There’s not a fixed fee, if you start to receive more traffic they’ll move you to a better server, but at a cost. Of course you don’t need to move the site yourself, but you’ll be paying a premium for that kind of support. Generally you can get a decent VPS server for cheaper than you can get a good package with managed hosting. So it really comes down to whether you want everything taken care of for you and don’t mind paying a little extra. 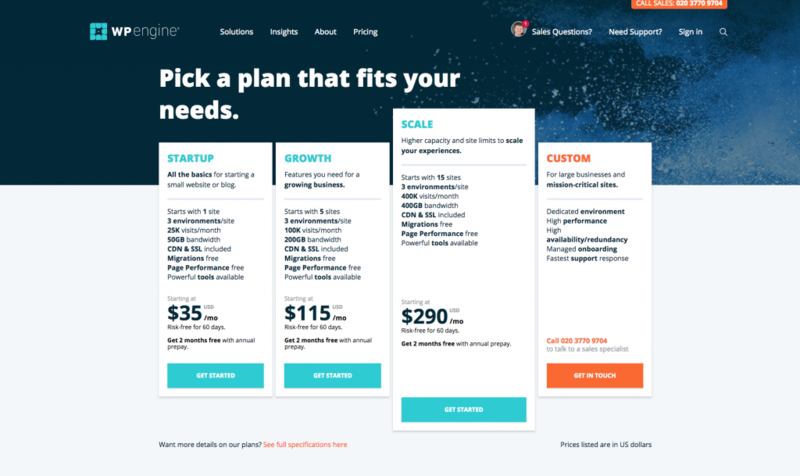 WPEngine is a good example of a good WordPress Managed Host that we actually recommend very highly as their prices are competitive and we’ve never encountered problems with them. It’s about weighing up the pros and cons of what’s best for your needs when it comes to WP Managed Hosting Plans. We’ve already reviewed all of these hosts on the site before as we consciously know that a LOT of our users are going to be looking to host WordPress sites. However, it’s not quite the same as addressing the WP issue directly like we’re going to in this article. Remember these are just statistics we’ve gathered using our own benchmark tests​, these figures may change over time. * Above data collected on each site using lowest plan (shared). All of our tests were performed using Pingdom, Uptime and our Support data was based on our own attemps at getting support over the course of one month. While it’s worth mentioning that not all of these hosts are equal, these are still the five best hosts we’ve ever used for WordPress generally. So while some beat others by a mile, any of these hosts on a decent plan will outperform these metrics. Still not decided? You may want to check out our in-depth review of each host to find out a little more information about each, as well as take a look at the various plans they offer. Great for larger businesses, solo bloggers and affiliates who want to segregate their hosting needs to different providers. Inmotion is best for smaller affiliate marketers who need to host multiple sites on a decent speed / performance server. Good for smaller businesses and affiliates, offers decent all round performance for those that need flexibility. Excellent for solo bloggers and small-medium businesses who need a managed solution to take away guesswork. Best for medium-large businesses, serious affiliates and bloggers who need the absolute best performance. 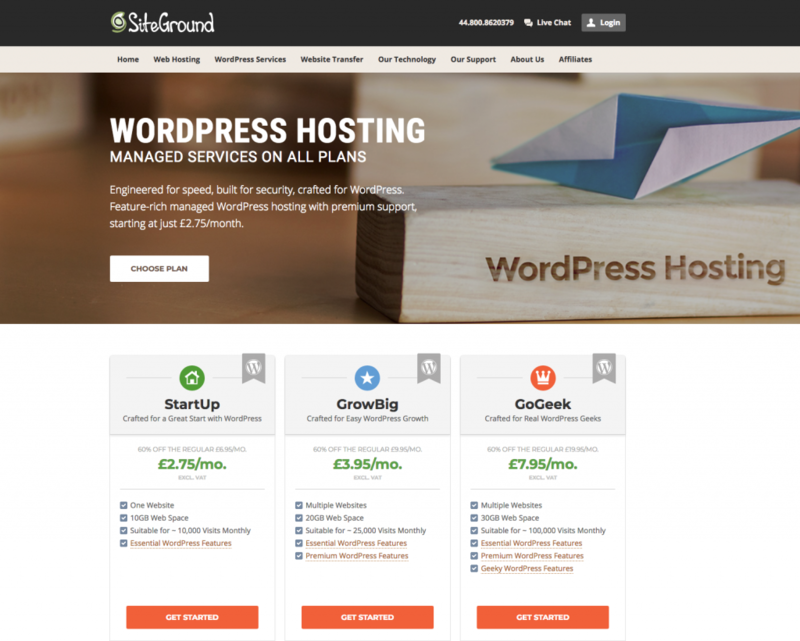 Siteground are one of the most reliable hosts we’ve ever come across, and they also have fantastic support. We’ve been using this host for some time now, and this is because despite them not being advertised as a ‘Managed WordPress Hosting’ solution, they have gone out of their way to make their hosting as WordPress friendly as possible. When it comes down to it Siteground may not be the cheapest solution out there, but when it comes to reliability and support they’re second to none. Again if you look at our findings, they’re not the fastest host, but certainly aren’t the slowest out of the bunch either. Inmotion hosting are popular as they’re one of the more reasonably priced options, but when we looked at their shared plans in depth it was obvious why. They’re the slowest of the bunch, but their average speeds still beat some of the shared hosts out there such as Hostgator. So if you’re looking for some good WordPress hosting that doesn’t break the bank then Inmotion is our pick. Dreamhost aren’t too dissimilar to Inmotion Hosting . However, what you gain in speed and uptime you lose in the way of support. There aren’t many differences between these two hosts, so it really has got to come down to what you’re willing to give up, or what you personally feel is more important for your site. WPEngine are our top pick for Managed WordPress Hosting, we think they’re a great solution and they make everything so easy to get up and running or transferred over to their servers. They’re certainly fast, but as you start to pay more for higher plans (based largely on usage and visits) then you’ll definitely see a more pronounced speed improvement. So while our figures show they’re only the second fastest, if you wanted to pay top dollar to them then you’ll get even more performance for that money. A2 Hosting are so underrated, and it’s sad as they’ve consistently performed excellently for us in the past. Again, they’re not the cheapest of hosts on this list but definitely more competitive in terms of pricing than WPEngine or Siteground. Since they’re the fastest, it should come as no surprise that they have really good datacenter locations. When paired with a CDN and a well built WordPress site you can have a truly blisteringly fast site. In our full review of A2 Hosting here you can actually see the results of that on our own site, without the CDN enabled. As we said, we think that the best host for those using WordPress and are on a budget is InMotion Hosting. These guys offer very competitive pricing and are faster than most of the other cheap hosts like Hostgator, BlueHost and so on! The best host for small businesses using WordPress CMS is undoubtedly going to be InMotion Hosting or Dreamhost. Both of these hosts outperform most of their rivals who offer shared hosting plans at the same price point. In our opinion, a small business isn’t going to need more than a shared hosting package, and with so few resources being consumed by small businesses it’s unlikely that you’ll ever need to worry about it not being enough. Since both of these hosts offer automated backups it’s also an added plus for small businesses. This question is a tricky one, because it all depends on the size of the blog, the amount of visitors and how quickly you’re growing the blog with new content and visitors! In our opinion most bloggers could benefit from doing what they do best, which is blogging and allow someone else to take care of the hosting for them. This is why we recommend WPEngine to bloggers. They’ll take care of everything for you, and only prompt you to upgrade your plan when you really need to. Affiliates need to be using something like A2 Hosting and this is because unlike Siteground and WPEngine they’ll allow you to add more than one site. With the latter two hosts you need to pay additional for each add-on domain, and so this means that if you’re running multiple sites (which most affiliates do) then it’ll get pricy very quickly. Since a lot of affiliates rely on Google for traffic, the added speed of A2 Hosting also offers them an advantage in the SERPs! We think that bigger businesses will benefit from using Siteground. Not only are they the best in terms of support, but their VPS packages are second to none. Since most big businesses will be using more resources and getting more traffic, getting a VPS rather than shared hosting is critical, especially with a WordPress site. Unlike affiliates, most big businesses do not need to run multiple sites and so the fact that Siteground charge additional fees for adding more than one site, it’s unlikely that this’ll ever be an issue. Choosing the right WordPress host for you is important, and it’s difficult to figure out without a little guidance. In this article we’ve successfully demonstrated some of the key things you need to look at when doing your own research. We’ve tested our top 5 WordPress hosts against each other on their basic plans and by doing so we’ve shown you how they perform. Then we’ve given you our personal recommendations for which host will work best for whatever situation in the FAQs.